Running this on my I7 7950. Seems to have sparked things up a bit. crunching 3 astropulse WUs at the same time. Have yet to see anything from version 7. LawryB - If you are using app_info.xml to get version 6 work, (Astropulse) then you will not see v7 work till you add the v7 apps to the app_info. For WINDOWS, if you want to get all V7 work, GPU and CPU, then you need to finish all the V6 work, or abort them. 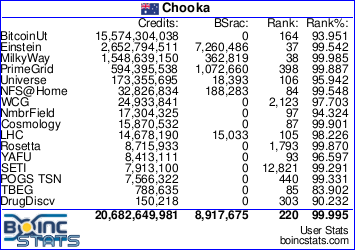 STOP BOINC. Copy the app_config.xml file to another folder for now. Then rename / delete the app_info.xml. I went even further and removed seti, which clears the folder then deletes it from the system, then attached to seti and the GPU and CPU V7 work will start on it's own if you have "SETI@home v7: yes" selected in your preferences. There are standard versions of ATI and CUDA for windows in version 7. Put back the app_config.xml file. 1) Finish all the units. 5) In the BOINC Manager go to Projects tab, select SETI@home, click Reset project in the Commands panel (it contains, from the top: Update, Suspend, Allow new tasks, Reset project, etc.). For 5. I removed SETI and Attached again. Yes Dingo Thanks. Also read that credit rate for version 7 was pretty low. Will keep an eye on the forum. Well myself, I am running stock ATI apps for MB V7 and AP V6, the V7 credits are still doing the adjusting thing, so it may take awhile for that to come good. The Windows installer worked great, now have optimised Version 7 apps for CPU and GPU (HD5) Multibeam. Now if they could only get CUDA Optimised apps for Version 7 I would be happy camper. I think the important message here is This update will happen automatically, unless you use a special version you got from another web site. Also in the same thread was this statement. We plan to stop making new v7 work within a few days, because v8 really is more accurate when searching for Gaussians. You can keep v7 until you run out of v7 work. I noticed this very strange rant from SETI. Any of our SETI crunchers know what's behind this? I believe it has something to do with the protests at Berkeley in the USA in an endeavour to stop a speaker sharing her views there. Some users have been threatening and sending abusive messages to the admins of SETI, and threatening to boycott the project if something isn,t done. Alas as the admin have stated, Berkeley really do not have a lot to do with SETI and these people are just wasting their breath, as Berkeley would not pay any attention anyhow. Admins are basically saying leave us alone as we are not involved and do not have any influence, and we are just here for the science. I believe this is a basic gist of what is happening. Ah, that would be Ann Coulter. Berkeley loves free speech as long as it agrees with their socialist politics. Much ado about nothing. Thanks! I do not look at SETI very often.